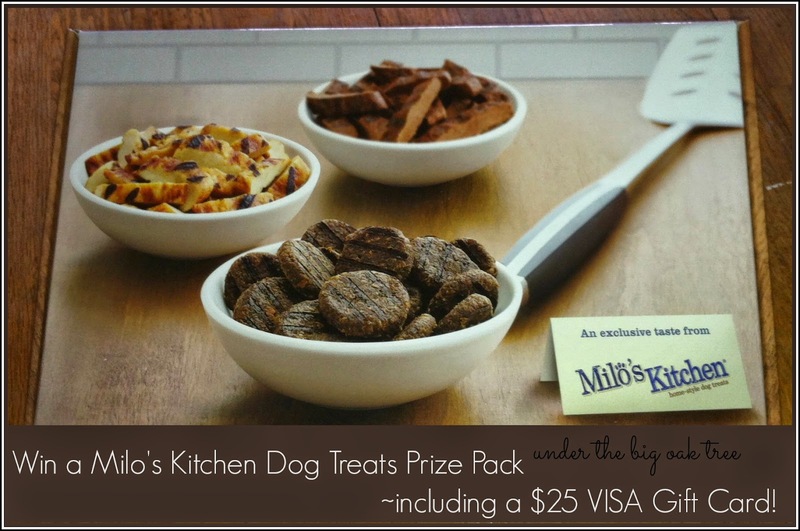 Disclosure: The Milo’s Kitchen® dog treats, gift cards, and information have been provided by Milo’s Kitchen®. Anyone that knows me personally, knows that my dog is my first baby. My Remmy Girl is part of the family and she knows it! She is spoiled and cuddled on every available minute of the day! She returns the favor, too! When I was pregnant with Grace, she never left my side. Always following me and snuggling with me throughout the entire pregnancy. Because she is so loyal (and cute, too! ), I like to make sure she is happy. I buy the food she likes, she gets new toys more often than some kids I know, and I like to keep the cupboards well-stocked with delicious treats! 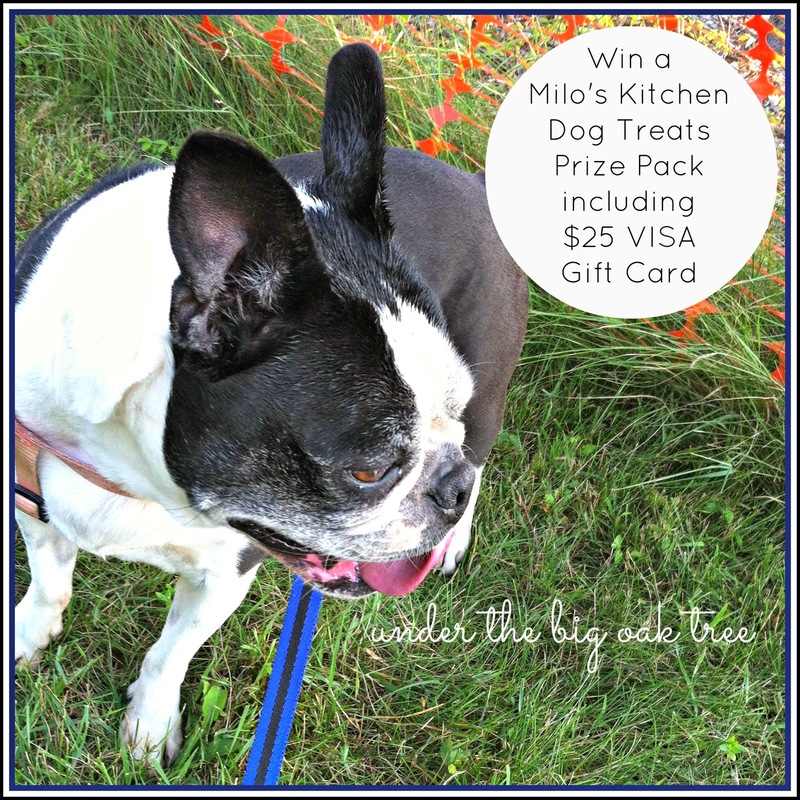 When I was offered the chance to let her sample some Milo's Kitchen dog treats, I was really excited! Especially when I found out that they are Made in the USA! Remmy LOVES people food and we do give her some table food, but try to limit it as much as we can. Milo's Kitchen Treats have 100% chicken or beef as their #1 ingredient. With the varieties of treats available, dogs get the taste of people food but in a treat made especially for them! This is a photo of the box that my prize pack was shipped in. See how realistic those treats look? Remmy and her pals (Sweet Pea the Pomeranian and Sammy the Border Collie) gobbled up these treats so eagerly, I wasn't able to get pictures! · Our dogs deserve only the best. That means treats made in the U.S.A. with real chicken or beef as the #1 ingredient, and no artificial flavors and colors. · Milo’s Kitchen® Home-style Dog Treats believes dogs deserve treats made with the same quality of ingredients and care that you want for your food. That’s why we made a treat truck just for dogs! · Each recipe is carefully prepared to bring out all the flavors your dog loves. Milo’s Kitchen makes a unique line of mouthwatering varieties for your dog including: Chicken Meatballs, Beef Sausage Slices with Rice, Steak Grillers Recipe, Chicken Grillers Recipe, Grilled Burger Bites, and Chicken Jerky Recipe. · Please let us know if you plan on attending the event so we can be sure to keep you updated on any location changes. · It wouldn’t be a food truck without home-style dog treats! Your dog is invited to try free samples of Milo’s Kitchen® treats so you can figure out which varieties will have your four-legged friend begging for more. · There’s no such thing as too many pictures of dogs. Receive family portrait photos straight from the Milo’s Kitchen photo booth or take your own selfies. Don’t forget to show off your dog’s look on Facebook, or via Twitter and Instagram using the hashtag #MKTreatTruck. 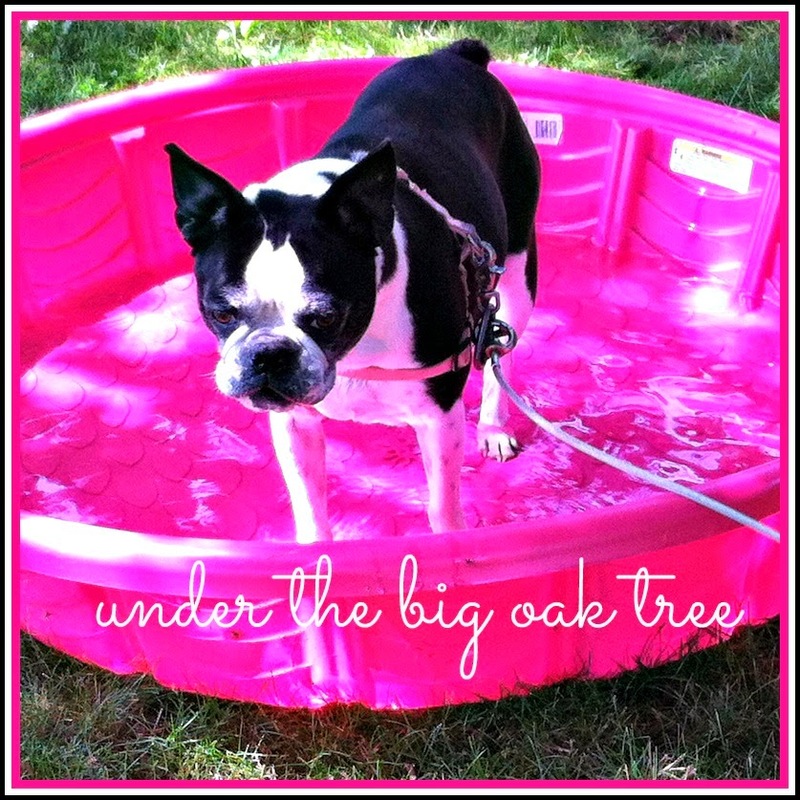 Winner will be chosen randomly via rafflecopter and will be notified by Under the Big Oak Tree via email. Winner will have 48 hours to claim prize by replying with their shipping information (sorry no P.O. Boxes). Failure to claim prize within the time frame will result in a new winner being selected. I learned there are no artificial flavors or colors. I'd love to win this for my miniature poodle Cocoa. I would give these to our dog Hamish! I want to share this prize pack with my pug Mur. Learned that all Milo's kitchen high quality treats are made right here in the USA. everything's made in the USA! These treats would be for Troy. This would be for our dog Molly. I would love to win this one for our pup Ginger. If I win I will be sharing with our Boxer boy Loki :)! Thanks for the opportunity to win such a fantastic prize. I learned that their snacks that not only look like jerky, sausage slices and meatballs, but actually are 100% real jerky, sausage slices and meatballs. They are also made in the USA to boot.....Awesome! i would share it with my dog marley. I don;t have a dog. I would give the prize to my dog named Jack. I would love to give these treats to my dog Nancy. This would be for my baby boy, Max. Jada is one of them. And a friend of mine is dog rescuer -- and it depends on which dog she has at the time who will enjoy them :-) . I would share these treats with mocha and sky, they would be so excited if I won. I learned their products are made in the USA and they don't use any artificial ingredients or colors. I want to share it with my dog Bullet. He is a German Shepard/Rottweiler mix and he's an awesome dog. I learned that the shelf life is 18 months from the date of production. That's great. My little doggies - Foxy & Lucy would love to share this. They think they should live on treats alone. Sad for them, that doesn't happen. These treats would be excellent for Cinderella (my dog, I know, silly name!) But I think she'd just really love these! I would give this to my dog Teddy. I'd like to win this for my dog, Helen. Thanks. I would love to share this with my pup, Oscar. I would love to share this with my pup, Oscar! I would love to win this for my basset hound, Charger. I learned the treats are made in the US with no artificial flavors or colors. I learned that the product is made in the USA. This would be for Abby, our puggle! I would like to share them with Abby, our puggle. I learned that Milo's Kitchen dog treats are available in 3 sizes. I'd love to share this prize pack with Runt, our Jack Russell Terrier, and yes, she was the runt of the litter! I learned their products are made in the USA and contain no artificial flavorings. I want to share this with my Boston Terriers, Daisy and Oreo. I would share this Kirby who is my boyfriends' mothers dog. He's a bit spoiled but deserves it. This would be for my sister's dogs - she has 2 rescues. I learned that the treats have no artificial flavoring. i learned they are made in the Usa! i learned there is no artificial flavors. I learned they never use any artificial flavors or colors. I would be sharing this with our pugapoo Buddy.